According to the U.S. Centers for Disease Control and Prevention, more than 48 million Americans fall ill due to foodborne illness claims. Undercooked or raw food can lead to sickness for patrons of restaurants and cafes, which can lead to possible legal issues. While most cases of food-related illnesses are not serious and go away after a day or two, some cases can take a turn for the worse. Restaurants can take a good step in the right direction to safeguard their business by looking into hospitality insurance programs. But they can also learn how to cut down on the possibility of foodborne illness claims by utilizing some good rules of thumb and best practices. Here’s a look at some food safety tips to instill in every restaurant kitchen. Getting your staff trained and certified to prevent foodborne illness should be a common practice from the start. Adding this layer of protection is a diligent way of protecting your restaurant and your customer base who comes in. Managers and staff can take food-safety certification courses that help to educate everyone in real-world settings. These courses go over the risks of foodborne illnesses and how they affect not only the customers, but the integrity of a business. Additionally, local or state health departments can help with guidance on how to deal with prepping to keep foodborne illnesses away. Raw foods have to be cooked to a certain temperature to kill microbes inside, which cause illnesses. There are some foods like oysters, sushi or certain cuts of beef that can go raw or lightly cooked, however. There are some restaurants that keep foods like those listed above off their menu, but for restaurants that offer seafood or beef dishes, there needs to be clarity on their risks listed on a menu. Staff should be ready and willing to remind customers of the risks of ordering raw or lightly cooked meals as well. Cross-contamination is the scourge of every restaurant kitchen. This happens with microbes make the move from one location to the other like when someone working over a grill handles tainted meat and then touches another ingredient. This has the ability to spread to any and all surfaces, leading to illness. To avoid cross-contamination kitchens can keep meat preparation stations completely separated from other areas of a food prep area, putting wrappers or covers on food before it’s stored, and sanitizing cutting board and food prep equipment. It’s never a bad choice to wash your hands. When in doubt, make sure to wash your hands and stress to your employees how important it is to keep their hands and arms clean. It’s a simple task, but goes a long way when dealing with food, plates, forks, etc. Always make sure to wash hands after prepping food, but also when using tissues, eating, drinking, open and closing doors, handling dirty equipment or touching any part of your clothes or body. There are a number of things to do to better prepare food and keep illnesses away. 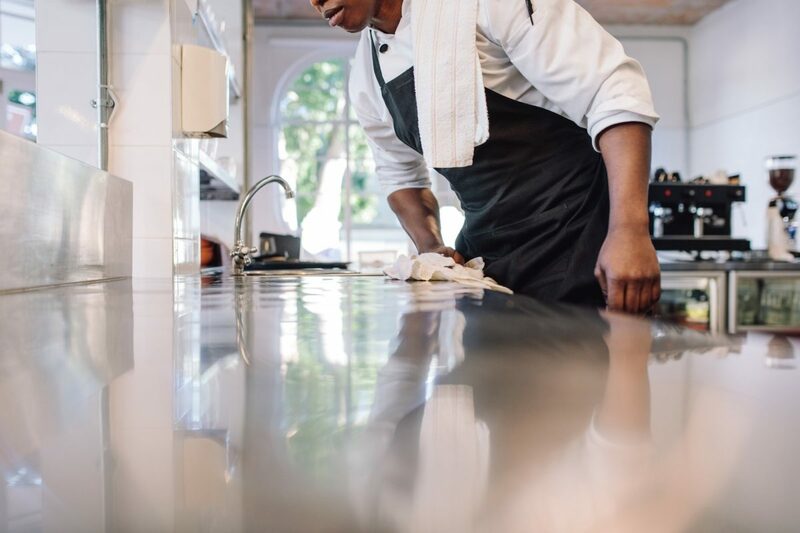 It’s important to practice simple, yet effective tasks in order to ensure the safety of customers to keep people from getting sick and keep your restaurant from getting hit with unwanted legal issues.